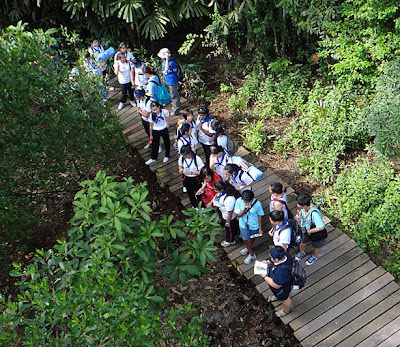 It is the time for the Naked Hermit Crabs' monthly guided walk at Chek Jawa. 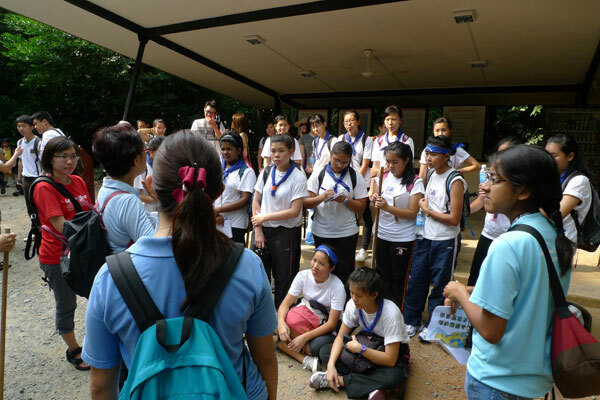 Today I have arranged for my school's Girl Guides (student leaders only) to join us for the guided walk since they needed to do recee trip for their upcoming camp in November. At the Ubin jetty, the captain (Mrs Teo) explains and show the guides about the granite rocks that can still be found near along the Ubin jetty and all the way in to the area in front of Pak Ali's shop. 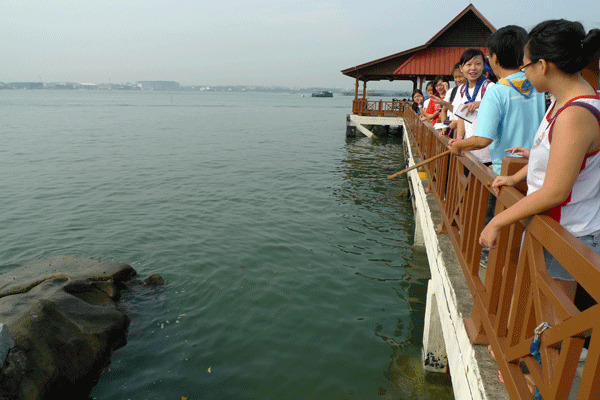 Explaining about the granite rock next to the Ubin jetty. The original Malay name of Pulau Ubin was Pulau Batu Jubin, which meant "Island of Granite Stones", because of the many granite quarries available to obtain these stones. For their recee trip, they had the luxury of taking van rides to and from Chek Jawa. I had fun sharing some of the interesting stories along the journey to the guides as the van drives past the Headman's house, the route to Chek Jawa, the Pulai Tree. I shared about the ostriches which used to be found at the backyard of the Headman's house (I have seen the ostriches myself before they were being relocated). It's so interesting to hear the funny answers the students gave. 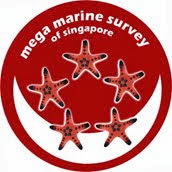 Upon arrival, I highlighted the presence of a bee hive in the roof of the Ubin map. Being leaders, the students need to understand their environment well and be on the look out for threats that might harm their group members. They are then given the task of finding out the name of the hut next to the alighting point - Punai Hut. I proceeded on to show the girls about the rubber tree and explained how the latex from the rubber tree is tapped and collected. Unfortunately, the demonstration setup has been removed from the tree but there were still some traces of dried up latex along the tapping. The rubber tree needs to be tapped and the latex collected early in the morning, before the sun rises. 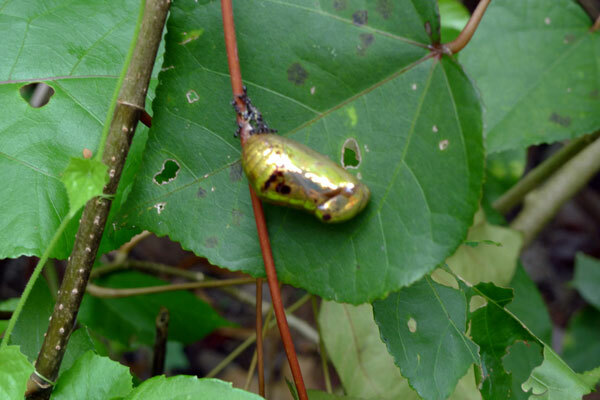 Mrs Teo further elaborates that this is why we hear stories about rubber tappers being eaten up by pythons - probably due to the lack of light, the rubber tappers do not have a clear sight of their environment. 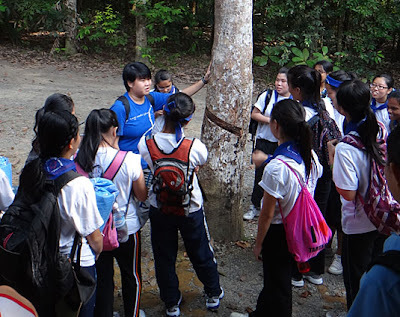 Me, sharing about rubber trees to the guides. Just nice, it was time to report for the guided walk. At the information kiosk, the crabs (nature guides of the Naked Hermit Crabs) have gathered with the visitors. I called order for the girl guides to assemble and Ley Kun gave a brief welcome and introduction to the girls, followed by a group photo taking session. 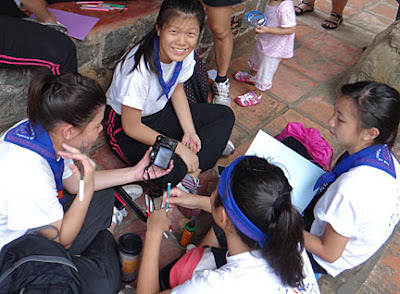 I had the help of Chay Hoon, who guided the other half of this 22 ladies girl guides troop. Along the boardwalk, a very friendly dog joined us. 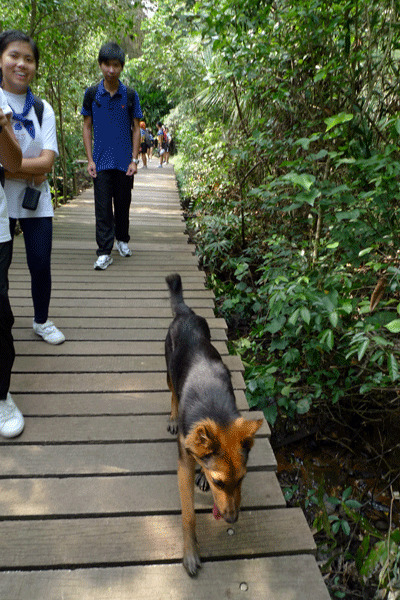 According to the NParks staff on duty, this dog comes from the Ubin town center and has been visiting Chek Jawa on a number of occasions. He did mention to me that this dog is expensive. The dog was rather well groomed and quite happy walking around in the mud, sniffing. 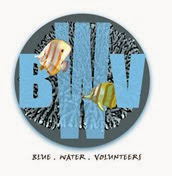 I shared many interesting information with my group - Jejawi tower, Jejawi tree, Nipah palm, mudskippers, sea holly, tree-climbing crabs, mud lobster and its mount, the mangrove trees, marine animals... etc. I had to talk more as I am building up future nature guides. 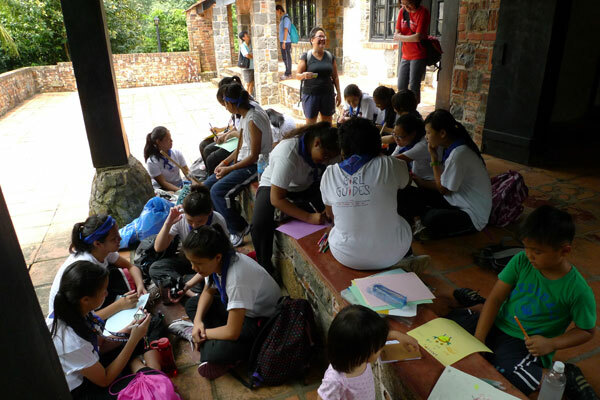 The girls were jotting down notes in their notebooks as they will be conducting the same walk for their Patrol members (Patrol in Girl Guides is similar to groupings, with each group having a leader as assistant leader). View of the guides from the Jejawi Tower. At our first sheltered rest stop, I noticed the usual mudskipper is sitting outside its hole. The only difference this time is that its hole is filled with water. During last month's guided walk, Ria saw a pair at the entrance. 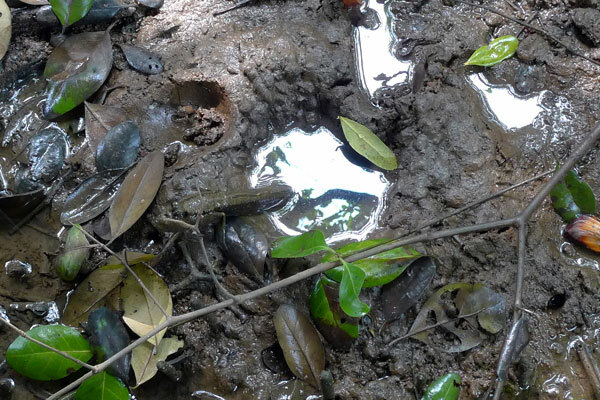 On closer look at my photo, it looks like a giant mudskipper has taken over the very same hole. I wonder what happened to the usual mudskipper. Mudskippers seen during last month's walk. 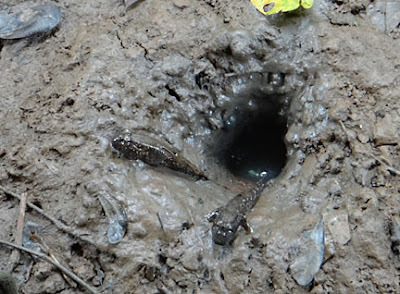 Mudskipper at the entrance of its hole. Referring to their camera for pictures. I had a great time guiding my own students, sharing my information with them in the hoping that they will do a good job to their Patrol members. They are a lively and fun group of visitors. 1. Locate the hibiscus plant in the school. 2. Locate the rambutan tree in the school. As the guided walk ends for the day, and being threatened by the approaching storm, the crabs retreated to the sisters' restaurant for our usual lunch dishes. 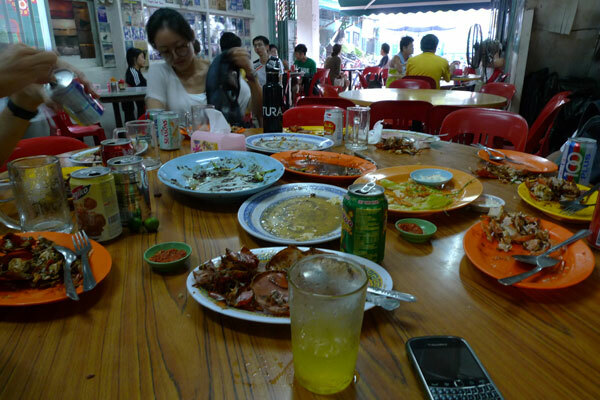 I don't have photos of the food, just only empty plates and shells. More photos will be added to this post when I have the links to the photos taken by other nature guides.